Benvenuto Olivieri was a Florentine banker active in Rome during the first half of the sixteenth century. A self made man without any great family patrimony, he rose to prominence during the pontificate of Pope Paul III, becoming involved with a variety of papal enterprises which allowed him to get to the heart of the mechanisms governing the papal finances. Amassing a considerable fortune along the way, Olivieri soon built himself a role as co-ordinator of the appalti (revenue farms) and became one of the most powerful players in the complex network that connected bankers and the papal revenue. 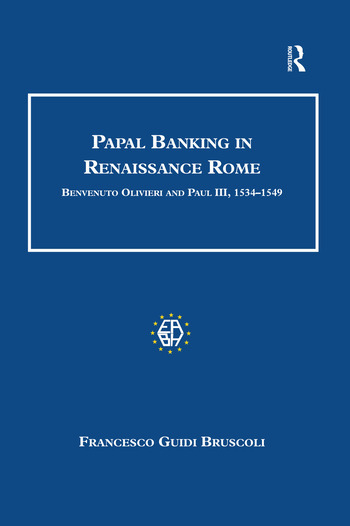 This book explores the indissoluble link that had developed between the papacy and bankers, illuminating how the Apostolic Chamber, increasingly in need of money, could not meet its debts, without farming out the rights to future income. Utilising documents from a rich corpus of unpublished sources in Florence and Rome, Guidi Bruscoli unravels the web of financial connections that bound together Florentine and Genoese bankers with the papacy, and looks at how money was raised and the appalti managed. Contents: Preface; Introduction. Part 1 Rome, Florence and the Olivieri: Florentines in Rome; The ascent of the Olivieri family. Part 2 Benvenuto Olivieri and the Apostolic Chamber: The depositary and loans to the pontiff; The papal public debt: venal offices and Monti; The customs of Rome; The provincial treasuries; Indirect and direct taxes; Other activities; The business turnover. Conclusion; Appendix; Manuscript sources; List of cited references; Index. Francesco Guidi Bruscoli is Researcher in the Faculty of Economics at University of Florence, Italy.